I agree that the ‘data revolution’ will not work without a ‘praxis revolution’. 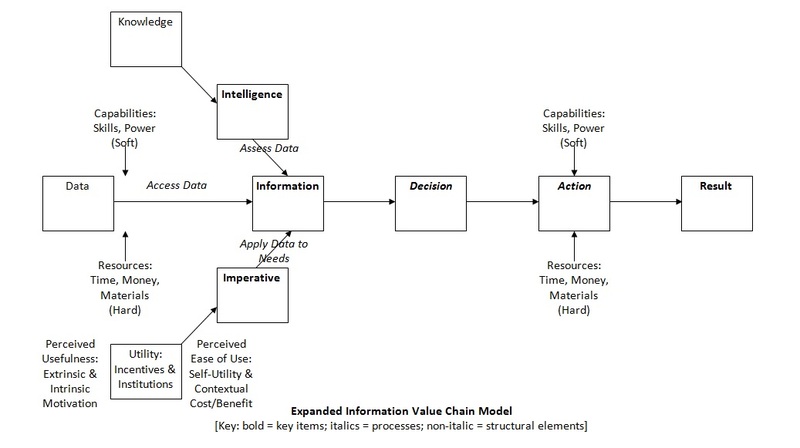 From my perspective the diagram is a little information-centric and suffers from envisioining knowledge and intelligence (and capabilities and resources) only as inputs. I would assign greater value to a model that was person-centric and which aimed at increasing people’s knowledge (self-knowledge and knowledge about ways in which social structure is inhibiting/enabling human-development) as valued means and ends of development. I would similarly view enhanced human capabilities and resources as important results of any development that we had reason to value. A praxis that was productive of knowledge, capabilities and resources in the person of the ‘intended beneficiaries’ of development, and that therefore resulted in their enhanced ability to self-actualise their own development, would perhaps contribute to a revolutionary praxis rather than to a praxis revolution alone? Neat phrasing! The diagram is already a little complex but you’re right that the intelligence and imperative wings ought to have two-way arrows since information is the basis for the creation of knowledge and motivation; and probably should have a couple of peel-back arrows from the ‘Results’ box indicating that development outcomes include development of knowledge, capabilities, resources, etc. I agree that peel-back arrows would be useful. It would also be useful to see the implicit human processing made explicit. Especially where ‘human development’ is the objective it is important that we remain conscious that it is the human processing of data that produces information, just as it is human processing of information that that produces knowedge. Human development can be seen as the action of applying knowledge, human resources, and technology to solve human-defined problems. Praxis, in the Frierian sense, is reflection upon this action and action based on this reflection. This ongoing iterative process not only peels-back newly-produced knowledge as instrumental inputs into future processe iterations but also represents enhanced human capability and agency – an end in itself in terms of Amartya Sen’s human development and capability approach.